Product prices and availability are accurate as of 2019-04-20 09:42:11 UTC and are subject to change. Any price and availability information displayed on http://www.amazon.co.uk/ at the time of purchase will apply to the purchase of this product. We're very happy to include J. V. Beckett's Coal and Tobacco: The Lowthers and the Economic Development of West Cumberland, 1660-1760 (published by Cambridge University Press) in our Lake District Industry section. Many parts of the English Lake District as we now know it have been significantly shaped by industrial activities. On a local basis mining and quarrying have both put food in the mouths of people in past generations and added to the fascination for Lakeland visitors today. 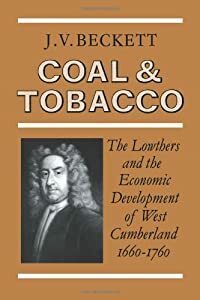 This book (Coal and Tobacco: The Lowthers and the Economic Development of West Cumberland, 1660-1760, by J. V. Beckett) includes much that will help readers understand one of these important commercial activities, just outside the boundaries of today's national park on the West Cumbria coast. It is not only the industrial and commercial activities described in this book that are important to the region. The Lowther family has had a massive impact over several centuries. Lowther Castle, currently being restored as a major attraction, became their centre. William Wordsworth's father was an important agent for James Lowther, the 1st Earl of Lonsdale, which is how the poet came to be born in such a substantial house in Cockermouth. Even today in 2014 the Lowther estates play a significant role in the region. The coal and tobacco industries may no longer survive but the Lowthers certainly do.